Right age to start horse riding? As a Mum of two, naturally I’d love my little ones to share my passion for horses. You hear of true horse enthusiasts ‘securing’ their kids to the saddle at 6 months of age (indeed my sister and I did strap our young sister to a horse once with bailer twine, something which I doubt she’ll ever forgive us for (she’s never ridden since by the way)). But remember I’m now a novice having been out of the saddle for more years than I care to remember. And the thought of handling my toddler and a live animal at the same time doesn’t bear thinking about. So with Edward coming up to 3 years of age, I’m thinking of introducing him to riding with a few professional lessons. While I’m keen not to be a pushy parent (! ), I do think that introducing him early will help him to develop a natural instinct for horsemanship, should he want it! The right age to start horse riding is something horsey parents should think about very carefully. 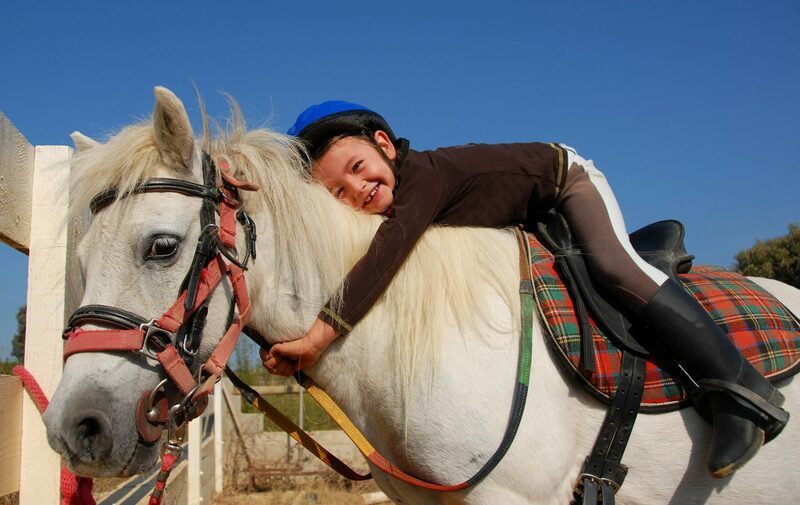 Many children love being around horses and may beg for lessons from an early age. However, enthusiasm doesn’t mean they’re necessarily ready. And a bad experience too early can put them off or delay their development as a rider. Begin by assessing the trainer and the school. Go to meet them and have a look around. Look at how well the school is maintained. Are their horses happy and healthy? Try to observe a class with riders of a similar age to your child’s to assess how good they are at communicating with that age group. And ask to see the horses they use with younger riders, to judge whether they’re gentle and mellow. Younger children have short attention spans, so first lessons should be short. Making sure the child is correctly mounted will go a long way to ensuring that they don’t fall off. Comfort is also important. Helmets can be heavy for young necks, and chafing from jeans can cause saddle sores. Buying a proper pair of jodphurs or riding breeches can help. Your child will also need boots with a heel (to stop the feet slipping through the stirrup) and a certified helmet. Each child is an individual and as such there is probably no ‘right’ age. My approach will be to let Edward progress, or not, at his own pace and I won’t be putting any pressure on him to enjoy something which is actually my passion and not necessarily his! This entry was posted in General and tagged horse riding.